Love the designs, can't wait to use them in my journals! Excellent work. Great service. Thank you. I finally caved and bought myself a cute ring-bound planner. Of course, the first thing I did was design some inserts! In this digital age, I think we're all drawn more and more to the paper littering past eras: receipts, laundry lists, ornate cheques, calling cards. As a writer I find particular delight in examining these forgotten, insignificant scraps and imagining the characters and stories behind them. 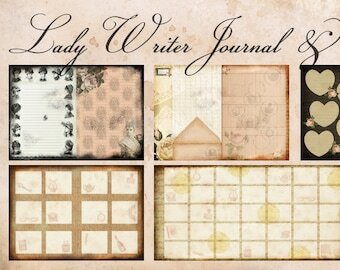 Recently, having discovered the printable journal community, I was inspired to put my love of vintage paraphernalia and patterns to practical use and so I began designing the Lady Writers Journal to help me organise my project notes and plans. At the moment, I'm collecting ephemera for some of the main characters in my steampunk novella series, Flora Victoriana. What stories will they unfold? Lady writer, dilettante designer of patterns, pages and book covers, dabbler in bookbinding. I write novellas and short stories and teach creative writing at the Lady Writers League. If you don't feel that the item is right for you, I'm happy to issue a refund within 30 days of your purchase. >> Please take care to print your images at 100%, so that your computer is NOT resizing them. >> For digital scrapbook papers, you will obtain best results if your printer can handle BORDERLESS A4 printing (on A4 paper). >> I highly recommend taking your files down to your local PRINT SHOP instead of printing at home. In particular, if you're printing a lot of colourful pages it's likely to be more cost effective.